Lancets are small plastic cylinders that house a sterile grade steel needle held within a diabetic lancing device. The lancet needle is used to prick the finger for a blood sample commonly used by people with diabetes. 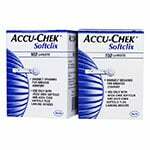 It is just one component of glucose testing kits. 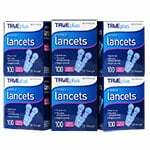 Are There Different Sizes, Colors and Styles of Lancets? 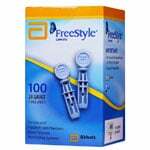 Yes, there are bright, different colored diabetic lancets which may please children and younger people with diabetes. 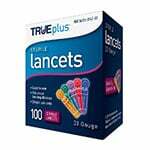 There are also different sizes of lancets. The original lancets were 23 and 25 gauges. 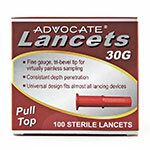 The most commonly used lancets today are sizes are 28 ,30 and 33 gauges. The higher the gauge number, the thinner the needle. A higher gauge will result in less pain and an adequate blood sample for most people but some people such as physical laborers with thick, calloused skin may not get enough blood. They may require a smaller gauge or thicker needle. How Do You Use A Lancet? 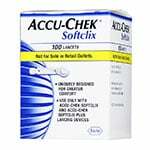 A new lancet should be used with each finger prick for a clean test with little pain. Re-using a dull needle may cause more pain and possible infection. The lancet needle is very thin and can become misshapen after initial use. Washing your hands with warm, soapy water and dry your hands thoroughly. Load the new lancet into the diabetic lancing device and remove the plastic end. 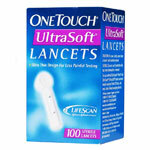 Replace the lancet device cover and pick a depth from the device dial settings. Most lancing devices offer at least 2-3 settings with some offering up to 10 various settings. The higher the depth number the deeper and more forceful the stick. Most people do not require a high setting unless they work with their hands and have tough, thick skin. Prick the side of the finger to draw a droplet of blood. Finger tips have the most nerve endings which will cause additional pain. Place the drop of blood directly onto the strip. Remove the used lancet from the lancing device and dispose of it properly in a red container or heavy plastic container used for needles. 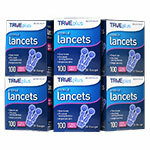 Check with your state on how to dispose of lancets properly in the state where you live. You should never share lancing devices. Change Fingers - This can help prevent scarring or skin callouses. Don’t use the same finger every time for your blood sample. Alternate Site Testing - Some lancing devices allow for samples from other areas of the body than the side of the fingers. Some devices can be used on the palm of the hand or forearm. Check with your physician about using alternate testing sites since alternate sites may not be as accurate especially when rapid changes are happening to your blood sugars which could be due to meal time, sickness, infection, sleep or exercise. Do I Have To Use The Lancet Device That Comes With My Meter? 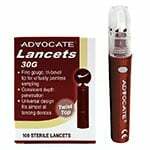 People generally use the lancet device that comes with their glucose meter kit, but you can purchase a separate device if you have trouble using the original one. The functionality of lancet devices are the same, however some may offer different features and may be more comfortable for your testing needs. 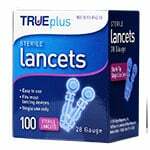 Are All Lancets Universal To All Lancet Devices? 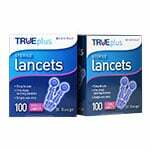 Some lancets are universal, yet others are not. Some are circular in shape while others are square shape. It is important that your lancet fit into your lancet device. 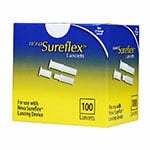 Some lancets are single use while others are called Multiclix. These come in a multi-lancet cartridge. 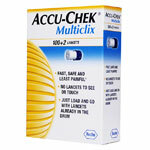 People using Multiclix will not need to change their lancet for 6 sticks. They will also not have direct contact with an open needle.